The rugby rivalry between New Zealand’s All Blacks and South Africa’s Springboks became part of each country’s sporting legend as a result of the Springbok tours of New Zealand in 1921, 1937 and 1956, and the All Black tours of South Africa in 1928 and 1949. The racism of white South Africans impacted on this sporting relationship, commencing with South African shock at having to play a Maori team in 1921. Their refusal to play the New Zealand Maori team on their 1937 tour prompted calls from Te Arawa and other iwi for a boycott. 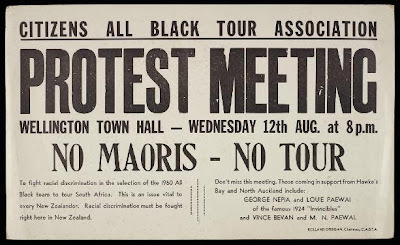 South Africa’s introduction of apartheid policies in 1948 resulted in the New Zealand Rugby Union agreeing to South African demands to exclude Maori players from All Black tours of South Africa. This led to huge protests against the 1960 All Black tour under the slogan ‘No Maoris, No Tour’. But despite a petition signed by 160,000 people, the government refused to intervene. South Africa offered to reclassify Maori players as ‘honorary whites’ for later tours and, despite continued opposition within New Zealand, the Rugby Union accepted this condition for the 1970 All Black tour of South Africa. Anonymous telegram by visiting South African newspaper correspondent on Springboks vs. New Zealand Maori XV, cited in New Zealand Truth, 17 September 1921. Most unfortunate match ever played. Only result [of] great pressure being brought to bear on [Springboks Manager, H. C.] Bennett induced them to meet Maoris, who assisted largely [in] entertainment [of] Springboks. Bad enough having [to] play team officially designated [as] New Zealand Natives, but [the] spectacle [of] thousands [of] Europeans frantically cheering on [a] band of colo[u]red men to defeat members of [their] own race was too much for Springboks, who [were] frankly disgusted. Tai Mitchell and Kiwi Amohau ,telegram to Springboks Manager, H. C. Bennett, cited in New Zealand Herald, 15 September 1921. Re your objections to playing against Maoris, if true, please convey to the Boers in your team the deep regret of the Arawa Maoris, who did not know your feelings in the matter, especially those who in good faith extended to you and the team the courtesies of their historical marae at Ohinemutu. The Maoris would have appreciated frankness, but… to accept the welcome and break bread with our people, and then later insult them as you have done is not, according to Maoris, the mode adopted by honourable gentlemen. … May the better team in Saturday’s test win. As the New Zealand Wars dragged on in the late 1860s, the conflicts took on a harsher and more racially tinged edge. With British imperial troops progressively withdrawn from New Zealand after 1865, colonial troops and their Maori allies assumed sole responsibility for pursuing the war instead. In July 1868 the Wellington Independent newspaper called for no mercy to be shown Maori ‘rebels’ (see The Treaty of Waitangi Companion, p. 145). 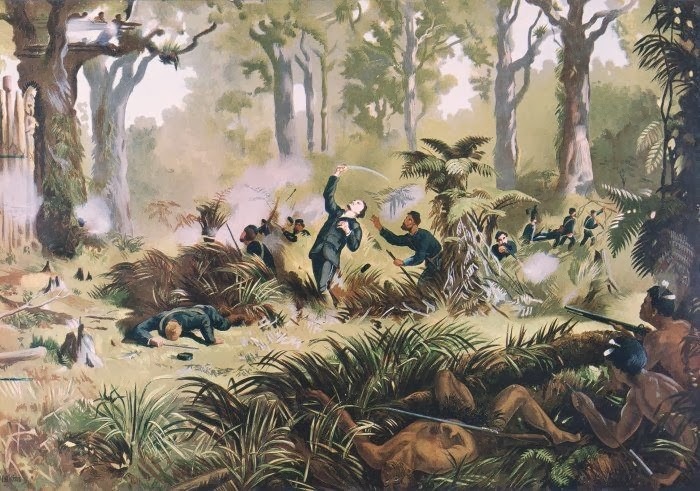 Its call for ‘rebels’ to be ‘slain without scruple’ was repeated in equally shocking terms after colonial troops were routed at Te Ngutu-o-te-Manu in September 1868. The newspaper’s views were hardly uncontroversial and were condemned at the time as ‘disgraceful to an Englishman’. But the very fact that the Wellington Independent felt free to give vent to such crude prejudices showed just how badly relations between Maori and Pakeha had sunk by this time.